US Vice-president Joe Biden has talked to Ecuador’s leader Rafael Correa by phone about fugitive Edward Snowden’s bid for asylum. Joe Biden held talks with President Rafael Correa on Friday, the two countries confirmed. According to Rafael Correa, Joe Biden asked him to reject the request but Washington gave no details. In a new development, a German magazine says a document leaked by Edward Snowden shows the US bugged EU offices. Spiegel magazine says a September 2010 “top secret” document of the US National Security Agency (NSA) outlines how the agency bugged offices and spied on EU internal computer networks in Washington and at the UN. The document explicitly referred to the EU as a “target”, the magazine reports. Edward Snowden is believed to be staying at a Moscow airport, having arrived nearly a week ago from Hong Kong, where he had been staying since he revealed details of top secret US surveillance programmes. The US has charged him with theft of government property, unauthorized communication of national defense information and willful communication of classified communications intelligence. 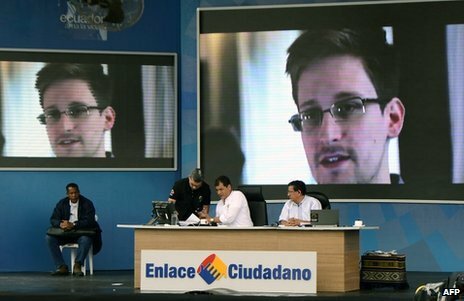 Ecuador has said it is willing to consider Edward Snowden’s request but only when he is physically in the Latin American country. Rafael Correa said on Saturday that Joe Biden had “passed on a polite request from the United States to reject the request”. If Edward Snowden ever came to “Ecuadoran soil” with his request, he added, “the first people whose opinion we will seek is that of the United States”. The Ecuadorean president, a leftist economist who received a doctorate in the US, denied he was seeking to disrupt relations and said he had “lived the happiest days of my life” in the US. White House spokeswoman Bernadette Meehan said only that Joe Biden and Rafael Correa had held a wide-ranging conversation. Edward Snowden’s father has said he believes his son would return to the US under certain conditions. Lon Snowden asked for “ironclad assurances” his son’s rights would be protected in a letter to Attorney General Eric Holder. He asked his son not be held before trial nor subjected to a gag order, and be able to choose where he was tried.